This week we have the last of our trilogy of images taken of trams at the front of Rigby Road Depot in 1997. There are four trams easily recognisable in this shot but possibly of most interest is the tram seen on the far right hand side – Brush Railcoach 633. 1997 was to be the last year that this tram would run as a traditional Brush Car with it being withdrawn from service requiring an overhaul. But for 633 – which is seen here in an all over advert for Browsers Markets – this wouldn’t be to the same style as previous Brush overhauls (as seen on 631 the other side of the picture) as it would become the first new Illuminated Feature car since the 1960s! The tram was converted into the Trawler and would return to service in this style in time for the 2001 illuminations. 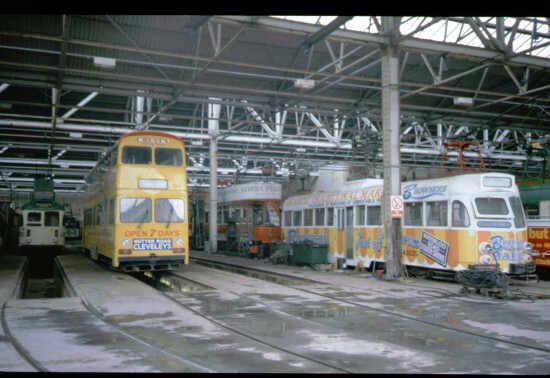 Also present in this photo are the aforementioned Brush Car 631 plus Jubilee 761 (advert for Cresta) and then behind 633 is Stockport 5 at that time in Blackpool as a tram of interest. Photograph taken on 8th May 1997.